This case study addresses the forms of relief emerging from grassroots initiatives organised during war by focusing on the case of Samidoun in the July war as experienced and narrated by some activists, organizers and experts. This study argues that a total reliance on professionalization and NGO-ization in aid provision during war can prevent the emergence of civil resistance forms of relief. It suggests that in a site that suffers from internal political tensions like Lebanon, “traditional” state and non-state structures were not able to provide immediate and sustainable aid for displaced families during the war. An organizational structure functioning outside traditional relief channels thereby helped prevent a humanitarian crisis outbreak. Local relief in the aftermath of the July war however turned the group from a collective to a local implementer of global relief programs, whereby providing relief and collecting in-praxis data were undermined, as it had to abide by the new and professionalized humanitarian terrain. To cite this paper: Lamia Moghnieh, "Local forms of relief during the July war in 2006 and international humanitarian interventions: Implications on community preparedness for war and conflict", Civil Society Knowledge Centre, Lebanon Support, 2015-06-01 00:00:00. 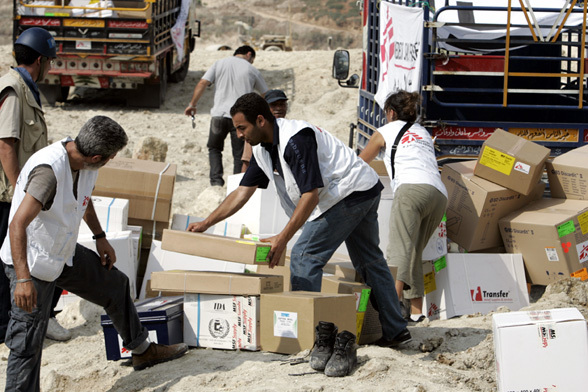 This case study explores the role of local relief efforts during wars and conflicts. It draws on the experiences and narratives of some volunteers, organizers and experts who were involved in providing aid and relief during the July war under Samidoun, 1 a grassroots platform that encompassed multiple and divergent forms of relief, initiatives, expertise, volunteerism and engaged in aid provision during the war. Rather than empirically assessing the success or failure of Samidoun as a collective experience of aid and relief, this case study seeks to highlight some of the transformative spaces and community-based forms of relief that emerged out of this grassroots platform during the war, thereby mobilizing valuable resources as local forms of preparedness to crises and wars in Lebanon. It draws from a specific pool of activist experiences and narratives of Samidoun as they organized themselves in the Zico house relief center in Beirut during the war.2 It focuses on their own form of relief organization, knowing that there have been other forms of relief that also identified with Samidoun. The relief collective that this study focuses on provided, organized and delivered aid to war-affected communities throughout the war and in its aftermath, by participating in the “postwar reconstruction” phase. Itmanaged to provide relief in a time when state, non-state structures and organizations were slow or non-responsive to the evolving humanitarian situation caused by the war. Samidoun, as a complex organizational relief network, brought people together across difference,3 thereby producing a social welfare solidarity campaign against the July war.4 Bringing people together across difference made this difference a valuable resource that was capitalized and employed to provide efficient relief. After addressing the methodology and limitations of the study, this paper is organized around the following axes: the emergence of the relief group in the first days of the war, the aid and form of relief organization it acquired during the war, and its postwar relief initiatives. A discussion and analysis of the case study, as well as recommendations for future practice will follow, focusing on the role of grassroots relief in launching a local form of preparedness and responsiveness to war and crisis. As this case study shows, the relief group provided important forms of aid during the war, at a time when state and non-state institutions were unable to promptly respond to the war. The postwar reconstruction phase drastically changed the structure and form of the relief group described in the study, as multiple global humanitarian organizations and funds arrived to Lebanon to start implementing reconstruction and rehabilitation. The humanitarian domain in the aftermath of the July war imposed a different kind of professionalized and NGO-ized governance of aid, slowing turning the relief group from a collective to a local implementer of global humanitarian programs. The research question that this study seeks to explore is the role of local forms of aid and relief during war and crisis, by drawing on local experiences from the July war.This case study is based on nine in-depth interviews conducted with people who organized themselves as part of Samidoun’s Zico house relief initiativesduring the July war and its aftermath. Some of the interviews were conducted for the basis of recording this experience, while other were conducted previously in 2012, focusing on the general experience of the July war for people living in Beirut. These interviews represent the basis through which the workings, organization and formation of the collective were recorded both during and after the war, as well as the problems and challenges faced in providing relief. The case study is also based on a general review of the literature on local and global relief during the war, as well as previous literature on Samidoun. The archive of Lebanon Support, that consists of more than 1,000 documents (memos and emails, internal documents, work methodologies, mapping exercises, assessments, databases, reports, among others) also represents an essential secondary source that informed the description of the collective. A roundtable discussion was held on a draft of the study that both enriched it and framed its limitations.5 As such, a few disclaimers have been included in this paper. First, this study does not claim to represent the experience of Samidoun as a whole, nor does it aim to record all the divergent experiences and initiatives that also identified themselves as Samidoun during the July war. As such, this study’s account of the organized relief emergent from Zico house’s relief center is representative of the activists interviewed themselves and cannot be generalized to encompass, record or summarize one experience of Samidoun. It follows that the relief initiative and organizational structure of the relief group that this case study records below is also representative of this group’s account of providing aid under Samidoun, and not of all forms of aid initiatives that emerged then and were also part of Samidoun’s story. This type of “coming together” that Samidoun represented was not without its problems, divisions and challenges. It witnessed ruptures, disconnections and fractions within the collective that are still unresolved today. As the roundtable discussion showed, volunteering and organizing in Samidoun was not solely about “providing aid” to displaced families during war, but about passionate and personal-political engagements that seldom clashed and ruptured around the ownership of Samidoun. As such, more work is needed to record the different and many left-out experiences and stories of Samidoun. One of the founding moments that both informed and structured local relief was the political sit-in organized against the Israeli military operation on Gaza in 2006,6 which coincided with the first day of the July war, on the 12th of July 2006.7 According to interviews, this political sit-in became a space in which the structure and organization of local relief were imagined and practiced. The sit-in took two weeks of preparation and organizations among different leftist legions, political groups, and movements in Lebanon.8 These preparations focused on a number of discussions, conversations and political organizations aimed at working outside of the internal political divisions emerging since the assassination of Prime Minister Rafik Hariri, with the sit-in mobilizing different independent groups and individuals into political action and protest.9 Coinciding with the first day of the July war, these groups became some of the main organizers for the local relief initiatives. In the next two days, with the bombing forcing many families outside of their hometowns towards Beirut, the sit-in was quickly turned into a relief campaign guiding the displaced to shelters.10 Simultaneously, a general mapping of the numbers and needs of the displaced families was initiated. At that time, there was no order issued by any state institution to open schools and host the displaced families, nor to mobilize any form of emergency aid. Displaced families from the suburbs and the south arrived to Beirut, not knowing where to go nor what to do. Schools were forcibly opened and protest banners from the sit-in were used to guide families to shelter and inform them of which roads were safe and which ones were blocked.11 By the fourth day of the war, there were already around 500 displaced person in Sanayeh Garden in Beirut while families kept pouring in.12 After a long meeting at Al Lika’a club to organize and mobilize the different attending groups and organizations into relief action, the group moved its operation to Zico house. Reflecting on the political atmosphere in the country and on the lack of national unity and solidarity, there was an agreement in the meeting on the importance of a civil form of resistance to war that could bring people together in spite of divisions.13 Interviewed activists highlighted that the organizational processes that led to the sit-in and to the emergence of Samidoun, had crystallized from an original form of collective action, gathering Lebanese and Palestinian activists in a context polarized by the March 8th and March 14th divide.14 The group used the style of organization and political work it was familiar with to divide itself into committees in order to organize relief and aid. In the first days of the war, there was still no set procedure or visible operation. The structure and organization of the relief group evolved during the war as the number of volunteers increased.15 Volunteers were divided into units according to their own skills and to the direct and immediate needs on the ground as the war progressed and intensified. The different gender, class and political-regional backgrounds that these volunteers came from provided a platform for rich and complementary resources and skills that the relief campaign was based on.16 Some interviewees referred to this form of organization as an habitual part of the political work that the organizers were used to,17 while others talked about how such division took place based on the volunteers’ own lives and professional expertise and resources.18 Divided based on their own academic backgrounds and overall skills, volunteers then shaped themselves and their form of aid depending on their own experience and expertise.19 This organization was also informed by the immediate and practical needs of the war itself, as it evolved in different ways.20 There were a logistic-distribution unit, a media and communication unit, a volunteers’ teams, an administration unit,21 a food-cooking unit, a storage unit, an internally displaced unit,22 a medical, hygiene-public health unit, and a psychosocial unit, among others. The media unit for example, later hosted by the Arab Resource Collective, became a space of media coordination through the launch of a blog on the relief,23 and the sending out of national calls for donations, writing proposals for donor organizations, undertaking fundraising, collecting funds outside of Lebanon, conducting interviews with more than 30 international radio shows, organizing and mobilizing international solidarity events and unifying and broadcasting the collected data for needs and statements about the war, information and communication.24 It was also responsible for coordinating with the media, schools and whoever was locally running them at that time. There were also other groups specialized in specific services, like the medical, psychosocial, children and hygiene units. Many of these services started on the first day of the war. This was the case for two reasons: First, the volunteers’ skills were directly utilized and employed no matter what they were, from graphic design to data analysis. Volunteers who were psychologists for example were sent with the team to provide psychological support for the displaced since day one.27 This rapidity in organizing specialized and skilled relief units was based on the volunteers’ own resources and did not require a complex bureaucratic organization or professionalized forms of emergency expertise.28 Moreover, when a team of doctors approached the center to volunteer, they were asked straight away to take control of their own organization, elect a representative and send him/her to the daily coordination meetings to join the relief the next day and be updated on the situation.29 The ease and simplicity of this procedure enabled a flow of resources, skills and local expertise that were accessible for the communities in the first days of the war. While interviewees seem to agree on the process, organization, and structure of the relief group during the war, as well as its relief services, postwar relief programs and services seemed to take on a different shape and form as the scale, complexity and diversity of needs changed after the war ended. The humanitarian relief domain was also transforming dramatically, with most international humanitarian organizations starting to help with the postwar reconstruction relief. Contrary to the war period, where challenges related to relief faced were directly addressed and mostly resolved, the relief group faced numerous problems in the postwar reconstruction period that hindered its relief campaign and challenged its structure.44 The group slowly turned from a grassroots collective to a local implementer of international humanitarian organizations’ relief programs. It finally collapsed as a political and independent collective in the face of the increasingly professionalized humanitarian domain. The group became “a medium” between local communities and the international organizations in the postwar area. According to interviews, several processes were at play in transforming the group from a collective to a local implementer of global humanitarian interventions. First, INGOs sought to turn the volunteers into NGO workers by providing them with different salaries that varied according to the specialized skills and background of each volunteer. Second, they forced a top-down and hierarchical organizational structure on the group by making them elect a director, a coordinator, and other NGO-like positions. No longer were the volunteers’ own skills and resources employed directly to the field for aid and relief, rather they were asked to provide relief in a much more professionalized and segmented manner. The group tried to challenge and defy some of these processes at first by imposing the same salaries for all volunteer regardless of position and skill. Within the new humanitarian domain that had been established, providing postwar relief became a much more difficult task as it seemed to require a special kind of expertise,50 while during the war, volunteers were providing aid based on their own resources, skills and knowledge. Most importantly, the relief group’s structure was continuously challenged by INGOs who demanded a more professionalized and hierarchical top down structure, resembling that of an NGO.51 This occurred in different instances like providing salaries for the volunteers, asking for more hierarchical leadership within the group and segmenting the relief process into different specialties and tasks.52 The group’s grassroots relief experience and structure collapsed after a few projects with INGOs, and in this process, many of previously engaged volunteers were hired by them as NGO workers. First, it seems that a grassroots and organic form of organization during the war was crucial and necessary to secure relief for war-affected communities and prevent the outbreak of a long-term humanitarian crisis. The July war, breaking at a time of sensitive political tension and divisions in Lebanon, caught the government and local non-governmental organizations by surprise. The government’s structure, influenced by political divisions and fractures, was late in responding to the needs of the displaced families and communities, and in mobilizing the Ministries to open schools and provide relief.53 Moreover, as the war broke out during the summer, most of the government’s institutions and offices were closed. Most local non-governmental organizations were also not sufficiently prepared and did not respond rapidly to the crisis by themselves.54 While few local organizations worked to provide relief, they were not able to provide aid for more than two refugee schools by themselves, nor did they have the funds and ability to do so.55 Moreover, they were not able to coordinate together locally in an efficient manner to mobilize local resources as one. Samidoun, more than anything else, provided a platform for coordination and cooperation between several different groups, ranging from social and human rights groups, university clubs, non-governmental experts and organizers, political party organizations, independent solidarity groups, Palestinian political groups, radical and leftist groups, to individual volunteers. According to the accounts that this study focused on, what was special about this form of relief was not necessarily the aid delivery and needs assessment but “the process of organizing people and groups, its organizational skill”.56 These skills seem to have reflected the principles, vision and spirit of the political sit-in, an event that aspired to break and work outside of the dominant political divisions in Lebanon after 2005. In that sense, the relief group’s political vision and program were not separated from its relief work. On the contrary, the group’s politics, understood broadly in terms of its structure, organization and political mobilization, and aid, were mutually constitutive of one another. Thus, this case reveals that during war and in a site that suffers from internal political tensions and conflicts, “traditional” structures like state or non-state organization were not able to provide immediate, expedited and sustainable relief for displaced families. An organizational structure that functions outside of the traditional relief work channels was more successful in providing immediate relief, thereby preventing the outbreak of a humanitarian crisis. In the absence of international humanitarian intervention during the war, this structure became even more crucial, as it took the role of mediating the needs of the displaced families with the state, activating state institutions’ roles and opening schools to host the displaced families.57 Moreover, the bottom-up structure of the group, if anything, enabled a “relief plan” that was directly contingent on the immediate needs emerging from the ground as the war evolved. It was renegotiated, reshaped and tweaked on a daily basis as multiple players, including war-affected communities, had a say in how the relief was to be executed. Second, the group, under Samidoun, was part of a relief campaign that encompassed different other groups, like political party organizations, radicals, leftists, independent members, social human rights groups, and civil society organizations. As Ann Tsing argues,59 this coming together is across difference, not in spite of it. It built on different skills, resources, networks, connections and expertise to provide efficient and sustainable relief. Through unexpected alliances, it produced a solidarity group that was able to provide efficient and sustainable relief. While these alliances remained temporary and did not translate into something sustainable after the war, they facilitated a flow of services and relief during it. Third, the flat structure of the group allowed for a flow of needs assessment and relief, depending on funds and donations acquired through personal contacts and networks, that would have been less immediate had it followed a standardized, rigid and top-down structure. There was very little waiting time for relief and an almost immediate satisfaction of needs, which created an engaged relationship of trust with the displaced communities. The group’s structure was also flexible and more committed to praxis. It was able to follow and adapt quickly to the changing needs on the ground as the war progressed. This structure was different from that of a non-governmental organization or from standardized international relief provided during war, where international workers arrive to provide a packaged and universalized form of emergency aid. Around the end of the July war, international humanitarian organizations began arriving to Lebanon to provide assistance and aid. Most of the humanitarian intervention then focused on providing relief in postwar Lebanon and assisting in the reconstruction of the country’s economic, social and political infrastructures. As the interviews and testimonies show, the role and structure of the relief group dramatically shifted after the war, as the needs became more complex. But most importantly, with the arrival of INGOs, the humanitarian domain was also transformed dramatically in terms of mobilizing funds, enforcing standardized and universalized procedures for action, as well as a call for coordination with local NGOS and state institutions. Interviews by Samidoun members describe relief initiatives and procedures in this period as chaotic in terms of coordination, and as corrupted in terms of aid provision and funds. Within this new humanitarian domain, the relief group, along with many other relief initiatives, became attractive for INGOS for three main reasons: its fiscal transparency and accountability,60 the data it has collected on the need of the displaced and the nature of the war,61 and its local expertise and relationship with war-affected communities. The last two reasons emerged directly out of the group’s bottom-up structure, as discussed previously. While it was the collective’s structure that produced a valuable praxis-like data and a local engagement and expertise in war situations, it itself became a problem for INGOS in their work with Samidoun, as the latter was expected to function more and more as a non-governmental structure. This took place materially through different processes like providing salaries for volunteers, imposing a top-down organizational structure on the group and seeking to turn its members into specialized and professionalized NGO workers. On the other hand, the collective, suffering from a dearth of resources and facing a complex humanitarian situation after the war, sought to work with INGOs in order to influence and transform their global programs and direct them towards local needs.62 While INGOs expected the group to function more like a “local partner”, with an organizational structure similar to that of local NGOS, the group was therefore turned into a local implementer of global programs. Many of its members, turned towards professional NGO work or started their own organization. The collective’s structure did not survive the new humanitarian domain, which was becoming more and more professionalized, NGO-ized, and more bound to global agendas of bureaucracy, emergency programs, concepts and procedures. By becoming a local implementer of global relief programs, the group’s ability to provide immediate “independent” relief, and collect in praxis data were both undermined, as the collective had to abide by the new humanitarian terrain. As some of the interviewed members mentioned, the waiting gap between collecting data on needs and providing relief, which now also became a segmented and packaged form of relief, created mistrust and impatience, especially in South Lebanon where the flood of INGOs had already made communities doubt the process of aid. The independent and flat structure that the group possessed, first perceived to be an important resource for mobilizing relief and understanding the locality of the crisis, quickly became intolerable by INGOS. The arrival of international humanitarian organizations at the end of the war, enabled a process of NGO-ization, forcing independent groups and volunteering forms of expertise to become “professionalized” for legitimacy reasons, thereby opening a market of professionalism of social and political action.63 The fate of grassroots organizing, and the local data, expertise and forms of aid that emerge from it, became unsustainable within the new humanitarian domain, dictated by top-down forms of globalized policies, interventions and funds. This affected the pace and efficiency of relief especially after the war. Moreover, the local resources that grassroots organizing have enabled during war influenced the levels of local preparedness and responsiveness to war in conflict sites like Lebanon, where internal divisions and a lack of state and non-state preparedness and coordination were registered. This case study argues that a reliance on the professionalization and NGO-ization of solidarity and engaged volunteer relief prevents the emergence of similar initiatives and campaigns in the future, thereby putting all the responsibility for local humanitarian action on the shoulders of state and non-state institutions. When local and organic forms of responsiveness to war become standardized, professionalized, and directly linked to global humanitarian policies and interventions, this has the potential to disengage humanitarian action from local resources that volunteers and political actors can provide during wars and crises. These packaged and standardized global interventions also seem to produce a gap in identifying, satisfying and addressing the field-informed needs that emerge during war and its aftermath. This case study suggests that empowering and encouraging independent forms of organizing can provide a rich resource for improving the local level of preparedness and responsiveness to future conflict and war. 1. In English, “Steadfast and resistant”. It would be worth mentioning here that Samidoun is not the first local form of relief during war in contemporary Lebanon; previous experiences of collective action during wars and crises have notably existed during the civil war (1975 and 1990) and during the consecutive israeli attacks on Lebanon. To read more on Samidoun: Candice Raymond, “Samidoun, trente-trois jours de mobilisation civile à Beyrouth », in Frank Mermier et Elisabeth Picard (dir. ), 2007, Liban.Une guerre de 33 jours, Paris, La Découverte, p. 58-65. Other relief initiatives also took place concomitantly during the July war and were documented by academics. Read: Karam Karam, “Résistances Civiles?”, in Frank Mermier et Elisabeth Picard (dir. ), 2007, op.cit., p. 51- 72. 2. There were other forms of relief organized and planned at the Zico house relief center during the war. This case study focuses on a particular form of aid and relief that emerged from this center. 3. Ann Tsing, Friction: An ethnography of global connections, Princeton, New Jersey, Princeton University Press, 2005. 4. Michael Lavette & Barrie Levine, ‘Samidoun: grassroots welfare and popular resistance in Beirut during the 33 day war of 2006’, in Michael Lavette & Vasilos Loakimidis (ed. ), Social Work in Extremis: Lessons for Social Work Internationally, The Policy Press, 2011, p. 31-50. 5. “Local actors versus global humanitarian interventions: the case of Samidoun during the July war on Lebanon”, Round table discussion, Lebanon Support, 23 April 2015, http://daleel-madani.org/event/local-actors-versus-global-humanitarian-interventions-case-samidoun-during-july-war-lebanon [last accessed May 12th 2015]. 6. « Beirut in solidarity with besieged Gazians”, Electronic Intifada, English, July 12th, 2006, http://electronicintifada.net/content/beirut-solidarity-besieged-gazans/6089 [Last accessed May 2nd 2015]. 7. Ethnographic accounts describe the sit-in organisation as follows: “more than 50 activists (independents, or organised from around 7 different organizations) used to meet almost on a daily basis to plan the sit-in that was planned to start on the 12 July 2006. Long meetings took place in Nadi al-Liqa’, that used to be then the shared locale of the Leftist Assembly for Change [a trotskyst collective] and Attac [an alternative globalization group]. Activists divided themselves into several committees: a cultural committee to organise artistic activities, media committee responsible for media relations and a logistical committee in charge of the overall organization of the event. As the Israeli offensive on Lebanon on July 12 coincided with the first day of the sit-in, an "emergency meeting" is set and the sit-in transformed into an initiative to organize aid to displaced people from the south”. Marie-Noëlle AbiYaghi, L’altermondialisme au Liban : un militantisme de passage. Logiques d’engagement et reconfiguration de l’espace militant (de gauche) au Liban, Université de Paris1-La Sorbonne, Thèse de doctorat en science politique, 2013, p. 60. 8. Interview with Bernadette Daou, April 2013 ; Interview with Bassem Chit, April 2013. 9. Interview with Bernadette Daou, April 2013. 10. Some groups retreated from the sit-in when it was turned into relief campaign. 11. Interview with Bassem Chit, April 2013. 12. Interview with Tarek Abdallah, January 2015. 14. AbiYaghi, 2013, p. 60. 15. Candice Raymond had accounted approximately 300 new volunteers per day. Raymond, op.cit., 2007. 16. Interview with Walid Abu Saifan, January 2015. 17. Interview with Mohamad Ali Nayel, March 2013. 18. Interview with Walid Abu Saifan, January 2015. 19. Interview with Walid Abu Saifan, January 2015. 20. Interview with Ola Ataya, October 2014. 21. Responsible for noting and coordinating all the donations delivered. 22. Responsible for following up on the locations of internally displaced people and coordinating aid on the ground. 24. Interview with Ghassan Makarem, February 2015. 25. Needs assessments covered different chronic and acute illnesses among other identified needs. Interview with Ghassan Makarem, February 2015. 26. Interview with Hiba Abbani, January 2015. 27. Interview with Tarek Abdallah, January 2015. 28. Interview with Tarek Abdallah, January 2015. 29. Interview with Bassem Chit, April 2013. 30. Interview with Ghassan Makarem, February 2015. 31. Interview with Tarek Abdallah, January 2015. 33. Bassem Chit, “Samidoun Relief Center”, internal report, 2007. 34. Interview with Bassem Chit, April 2013. 35. Representatives were elected on a daily basis and they would expire after 24 hours so that no representative can monopolize decisions for each unit. Interview with Bassem Chit, April 2013. 36. Bassem Chit, “Samidoun Relief Center”, internal report, 2007. 37. Bassem Chit, “Samidoun Relief Center”, internal report, 2007. 38. Interview with Bassem Chit, April 2013. This horizontal-like structure was inspired to a large extent by alternative globalisation collectives and anti-system groups in the early years 2000 in Lebanon. Many organisers of Samidoun were part of such groups or were socialized in similar organisational structures; AbiYaghi, op.cit., 2013, p. 227 and sq. 39. The flat structure described above does not seem to have been always successful, as was pointed out during the roundtable by activists and organizers who were part of Samidoun’s relief initiatives and platform. 40. According to the Samidoun Relief Center report (2007), the Beirut Southern suburbs focused only on psychosocial activities with children and youth and community organization. 41. Tyre, Srifa, Aita El Shaeb and Tibnine. 42. Interview with Ghassan Makarem, February 2015. 43. Field work notes from informal discussions with several INGOs representatives during the July war in 2006. 44. Interview with Hiba Abbani, January 2015. 45. Tarek Abdallah, January 2015. 46. On the role of emotions in humanitarian solidarity in France, read: Axelle Brodiez, “Emmaüs et le secours populaire Français”, in Christophe Traïni, Emotions… Mobilisation!, Paris, Presses de SciencePo, 2009, p. 79-95. 47. One example is influencing the food programs that came after the war in South Lebanon, which focused on distributing lentils and vegetable in an agricultural area. Interview with Ghassan Makarem, February 2015; Another example is how psychosocial units emerging from different relief initiatives challenged global humanitarian psychological interventions that understood psychological suffering from war in clinical terms Post-Traumatic Stress Disorder (PTSD). Interview with Ola Ataya, October 2014. 48. Bassem Chit , April 2013. 49. Interview with Tarek Abdallah, January 2015. 50. Hiba Abbani, January 2015. 51. Walid Abu Saifan, January 2015. 52. Interview with Hiba Abbani, January 2015. 53. Interview with Tarek Abdallah, January 2015; Interview with Bassem Chit, April 2013. 54. An exception to that might be the Lebanese Red Cross, which has its own structure and is trained to respond in emergencies. Also, many representatives of NGOs and organizations mobilized their networks and resources and worked together under Samidoun to deliver aid and relief. 55. Interview with Tarek Abdallah, January 2015. 56. Interview with Hiba Abbani, January 2015. 57. Ghassan Makarem, February 2015. 58. During the war, volunteers from “Movement Social” organization forcibly opened and enabled the activation of the ministry of Social Affairs. Interview with Ghassan Makarem, January 2015. 59. Ann Tsing, Friction: An ethnography of global connections, Princeton, New Jersey, Princeton University Press, 2005. 60. Interview with Tarek Abdallah, January 2015. 61. Interview with Ghassan Makarem, February 2015. 62. Interview with Ghassan Makarem, February 2015. 63. Interview with Ghassan Makarem, February 2015.